Willsboro, N.Y.: September 12, 2018. 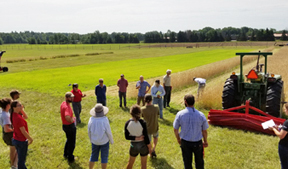 Seeing is believing and regional vegetable growers attending the Thursday, October 11, 2018 Field Meeting at the Cornell Willsboro Research Farm in Willsboro, N.Y. will see a variety of cover crop options and discuss their use in vegetable crop rotations. The Eastern NY Commercial Horticulture Program is sponsoring the 4 p.m. to 5:30 p.m. field meeting. There is no cost to attend, however, registration is requested online at https://enych.cce.cornell.edu/event.php?id=1002. For more information, contact Amy Ivy at adi2@cornell.edu, 518-570-5991. Growers will tour the field trials with Cornell Willsboro Research Farm Manager Michael Davis, and Eastern NY Commercial Horticulture Program Vegetable Specialists Chuck Bornt and Amy Ivy to learn how the use of cover crops following early season vegetable crops can help restore soil health that is depleted over years of annual crops on the same ground. “Growers, particularly those with smaller acreage, can struggle to find space and the justification to take fields out of production just to plant cover crops, but the use of cover crops is well known as a way to address a variety of soil health and productivity issues. This field meeting will allow growers to see it to believe it,” Ivy noted. The trials are part of the 2018 Advancing Vegetable Production in Northern New York project funded by the farmer-driven Northern New York Agricultural Development Program. The field demonstration plots also showcase new multiple species cover crop mixes that growers have been reluctant to invest in due to cost and, in some cases, establishment requirements. “One of the benefits of these research trials is enabling growers to see first-hand how the newer cover crop mixes are working in a test field before they commit precious dollars to try them on their own land,” Ivy noted. The presenters will address crop selection, establishment, and timing with the example of the same crops of millet, oats, hairy vetch and daikon radish alone and in combinations planted on two different soils on two different dates in August. The 2018 Advancing Vegetable Production in Northern New York project also includes research on nitrogen uptake in winter-grown spinach and opportunities for early harvest of popular summer high tunnel-grown vegetable crops.